I do any of the bhapa stuff in microwave. This is indeed a nice twist to Paturi. A must try. That line about the cha and shiuli is making me will some cool into this morning air. I do it on a skillet. 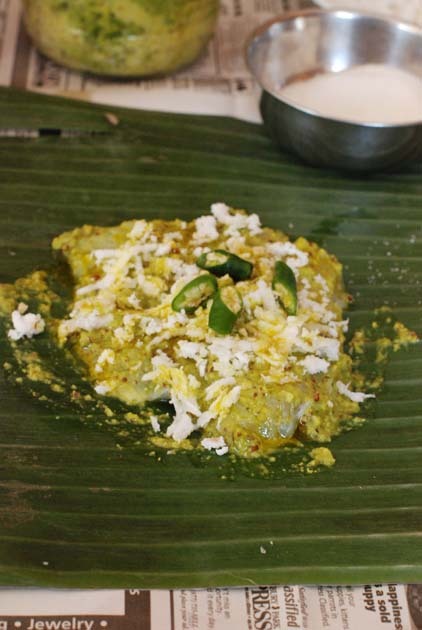 I can never reproduce the fresh kolapata and fresh fish paturi taste...I am still far away from that skill. Never had paturi with kashundi. Now I have to make it soon...already can smell the fragrance. The funny thing is, the cellulite ad at the bottom is very unappetizing. The ads served are context sensitive so depends on the user/viewer/browser history and some other logistics. Like at this moment the ad I am seeing is some "DealChicken.com"
no, no. nothing like that. sometimes they are random I guess. My granny used to do the twine thing too, with capsicum stuffed with a besan mixture. Woah...Loved your recipe. It's always a pleasure reading about your food. Tagging this recipe..thanks. And yes, The Book...congrats. Loved the cover- simple yet elegant. Tummy's growling.. would it also taste good with Rui maach? A little bit like the parsi patrani macchi. This looks so delicious. I am hungry. 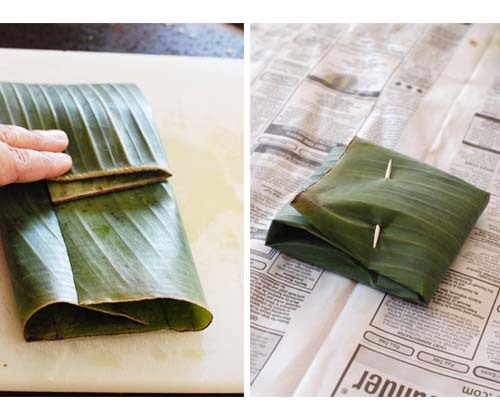 I am too lazy to trek to an asian store for over priced banana leaves so i just use heavyduty parchment paper (the french "en-pappillote" (in paper)way) and that works great too. Are you accessing my brain??? 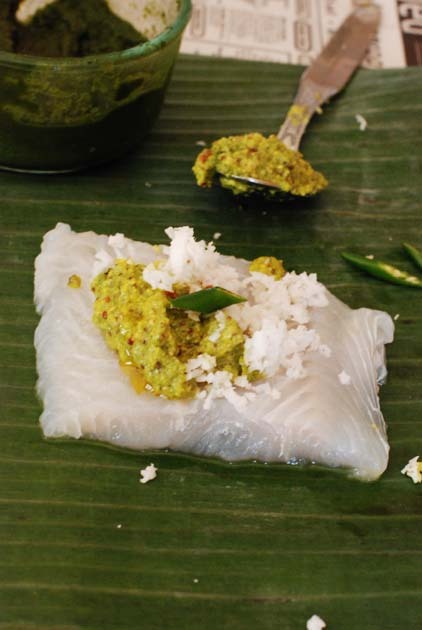 I was just thinking I had to make salmon tonight, and I'd just made your kasundi... and I have frozen banana leaves. This will be tonight's recipe, right on time! Thanks so much!! Kankana, I have a gas grill. Have not tried there, because I am afraid my kolapata might go up in flames. But in a charcoal grill, you can try putting in when the flame is dying like in a unoon. Do let me know if you try. Thanks for the awesome recipe I will be trying this soon once I buy some fish filets! I bought frozen goya banana leaf at the local shoprite and it was very cheap. Frozen coconut from the local patels and i'll be trying your kashundi recipe. Even your parcel looks very neat to me! This is a trip down memory lane. But I make the same thing in a clay Tagine without the banana leaf of course. The steam in the Tagine gives a new flavor to it. As an alternate to rice/oven,can we use a microwave for this dish? 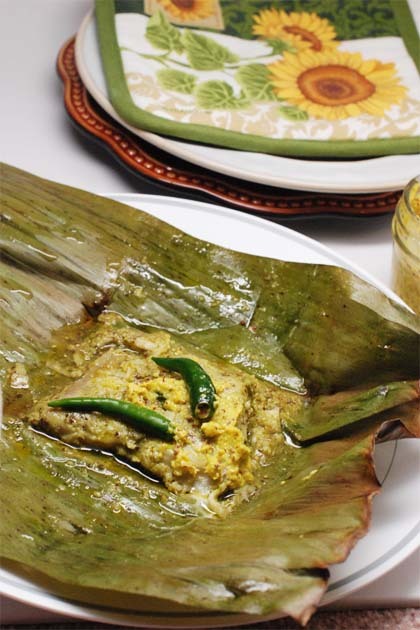 U make me drool with fish wrapped in banana leaf - we get the fresh leaf in festival time but way expensive, I must say the flavor should be out of the world. 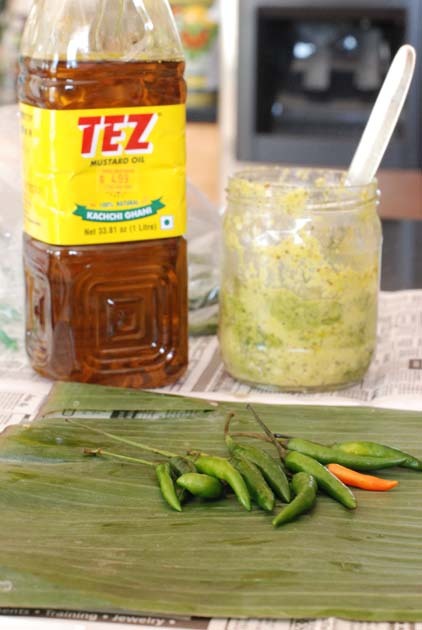 I have never been a very big fan of mustard, so though I always liked a well-cooked paturi I have often wondered about the possible substitutes. for instance, can it be made in posto? or curd? or any other marinade? You can use other marinade like in a Patrani Machhi or a Thai style wrapped fish that I have in my blog. Only curd will not work. Ginger-garilc paste or cumin-coriander-dhonepata paste will. Don't know if you can still call it paturi then. 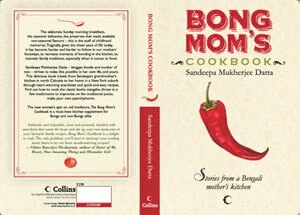 I made this dish with a few alterations such as used store bought kasundi and mixed in salt and pinch of sugar, coconut powder, green chillies and mustard oil all in the kasundi mix. Turned out delish. Thanks for providing wonderful ideas and recipes such as this. The Lau pata option is a favourite since the added benefit if of being able to consume the leaf too. I tried this recipe of yours and it turned out really well except an unwanted smell of banana leaf inspite of using the frozen ones. How to get rid of them? Hi. Thanks for sharing this one. 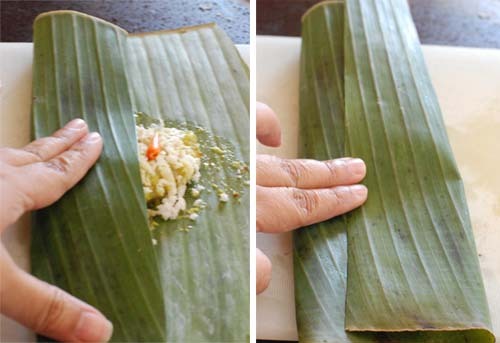 I was wondering if food foils will work instead of banana leaves, considering that it'll go into the oven. I don't think I'll have much luck finding banana leaves around where I live.